"Our challenge," Frawley said, "is to help our customers make it through this transition period." 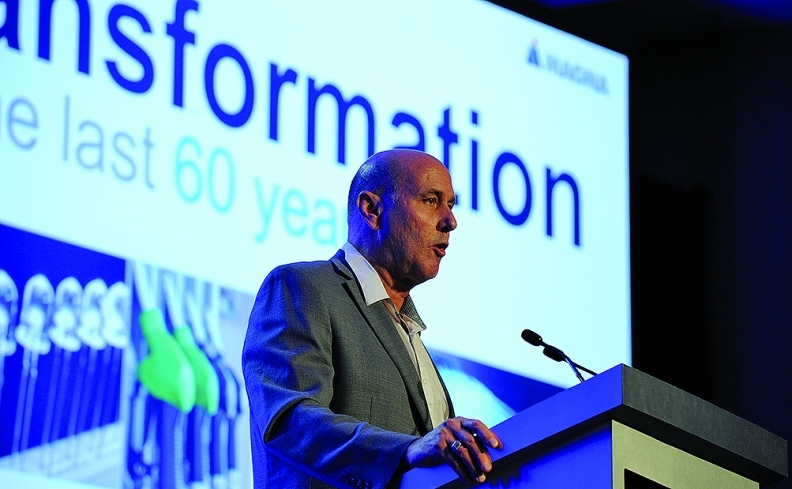 TRAVERSE CITY -- Despite conflicting global emissions regulations and consumer demands, automakers can profitably deliver vehicles with as many as 50 powertrain combinations, says Ron Frawley, senior director of strategic planning and corporate development for Magna Powertrain. Frawley, a 35-year industry veteran, laid out a scenario Tuesday at the CAR Management Briefing Seminars in which a vehicle architecture could enable a variety of powertrains. Frawley showed a rendering of a C-segment sedan with an internal combustion engine powering the front wheels. That car could be turned into a hybrid by installing an electric motor between the front wheels, not unlike what Ford offers with the Fusion Hybrid, or Chevrolet with the Malibu Hybrid. That would bring at least a 15 percent reduction in carbon dioxide emissions, Frawley said. Installing a second electric motor on the rear axle adds all-wheel drive, which improves handling and traction in the snow and reduces CO2 by another 3 percent, he said. Larger electric motors fitting in the same spaces could be used to turn the vehicle into more of a performance car, and that could lower CO2 emissions by as much as 75 percent. And the vehicle could easily be turned in to a plug-in hybrid that could drive around 30 miles on electricity only, Frawley said. He said automakers need to think about designing with that flexibility because the industry does not know if consumers will want more differentiation or how legislation will change. "We need to start thinking about scalable building blocks," he said. A vehicle built to handle a variety of powertrains would have highly integrated components with bolt-on modules that reduce complexity, he said. A flexible, modular drivetrain opens up opportunities for automakers to tune vehicles with software to differentiate them. Frawley called software an "essential building block." "Certainly with software, when you have a controllable device like an e-machine, you can really enhance the performance of the car, and you can offer variations of the performance of the vehicle, something the consumer would be interested in."